If you are hungry for something sweet that isn’t a frozen dessert (which with the cold weather right now who isn’t?) downtown Charlottesville has several places that we recommend. There’s nothing like a little something mid-afternoon or mid-morning with a cup of coffee or tea. 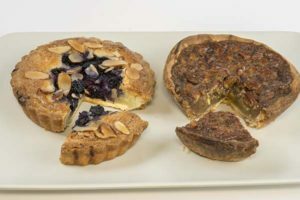 Our favorite places – in no particular order – are Paradox Pastry, Moon Maiden’s Delight, Patisserie Torres and The Pie Chest. Oops, that’s 4, which means we couldn’t narrow it down to three. shop opened last summer (warm days!) offering up high quality pastries, savory tarts and sandwiches, salads and soups. See their Instagram page for photos of their offerings. Serge Torres is the pastry chef at the Fleurie restaurant across the walkway and has an impressive pastry background. Since we were in the mood for sweets we selected two different ones to take home and enjoy. Not sure that YUM does it justice but this is a spot that we will be visiting whenever we are downtown. 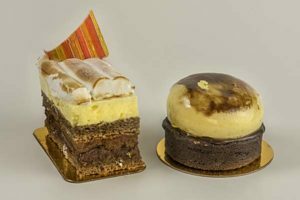 Paradox Pastry – a perennial favorite that we have talked about before. You need to check out their Facebook page or Instagram page to see all the wonderful items they make. Be prepared as you will start drooling. The day we were there the Blueberry Almond Tart and the Pecan Tart grabbed our attention as soon as we walked in the door. Of course we then had to look at everything that was in and on top of the display case but we stuck to our guns and walked out with the tarts. savory pies in wedges or as hand pies. Normally they have gluten-free or vegan options available but not the day we were there. Again we were going for sweet so our choices to have with our afternoon tea were Three Citrus Pie and Chocolate Hazelnut Pie (although we’ve had several of their savory hand pies – can attest that they are delicious). Both were incredibly good – the fillings melted in your mouth. I must admit that we split the pies and shared one in the afternoon and one for dessert in the evening – on the same day. Talk about treating yourself well! Check out their Instagram page for the latest offerings. foods in our diet recently and were intrigued when we heard about this pastry shop as that is all that they make and sell. We got there mid-afternoon and the display case was sparse. They did have several different items for sale – cookies, bars, pies and tarts. We selected the Blueberry Raspberry Bar – a delicious berry filling between cookie-oat crusts (probably not the best description for it). WOW! If you are gluten-free and/or plant-based you must check Moon Maiden’s Delights out. Unfortunately (or is it fortunately?) we weren’t able to visit our full list of pastry shops yet. Next on our list to try is Petite Marie Bette. We love Marie Bette Cafe so we are anticipating enjoying their new shop downtown. Have a wonderful time trying the downtown pastry shops. This entry was posted in Charlottesville, Local Foods, Restaurants by Foxfield Inn. Bookmark the permalink.